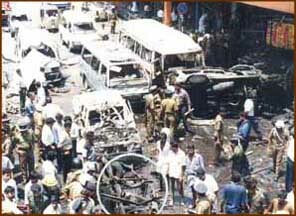 Police officers and Government Analyst officials inspecting the wreckage of the bus opposite the Maradana railway station. Only the chassis of the bus remained intact. See inside circle. Behind the chassis is the vehicle knocked by the Rosa bus. 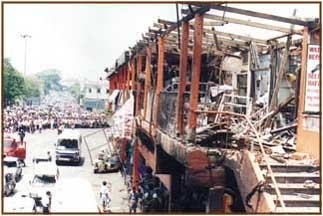 The blast destroyed several shops in the overhead bridge opposite the Maradana Railway Station.